Enlarge / I can’t believe we actually used to use software like this. Back in the early prehistory of desktop computing, we didn’t have Explorer for managing our files in Windows. We had File Manager. Explorer scatters windows liberally across our desktops—we’re still waiting for the tabs to organize the clutter—but File Manager never had that problem. File Manager came from an older time, the era of the Multiple Document Interface (MDI) wherein one File Manager window contained multiple separate panes for actually browsing your files. File Manager continued to ship with Windows long after it was replaced by Explorer just in case somebody needed it, but for the last decade or more, Windows hasn’t included it. To remedy this, Microsoft has released the source code of its venerable file management application under the MIT open source license. With this, you can build and run File Manager even on your brand new Windows 10 machine. The code has been very slightly updated; as well as the original 32-bit version, you can now build it as a 64-bit program (though there are some errors in the project files; I have created a fork that builds correctly in 64-bit mode). Whichever mode you prefer, this release brings a taste of the 1990s to 2018. Microsoft’s source repository in fact has two versions of File Manager; the original version, and a slightly updated version with some extra features to support, for example, ctrl-c and ctrl-v to copy and paste files, and handle some file system capabilities that were introduced after File Manager’s heyday. I don’t believe that either version has much in the way of high-DPI awareness, so it may not be tremendously usable on high resolution screens. 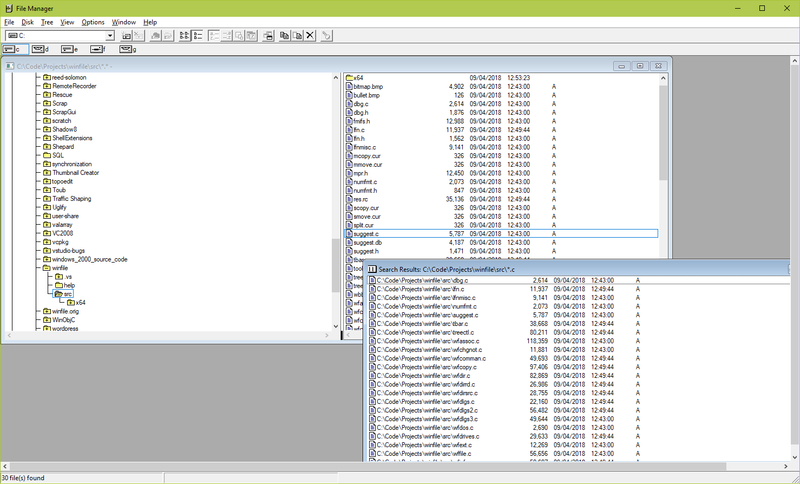 From some quick testing, using File Manager today feels very strange; quite. Aside from overall ugliness of the thing—the fonts, the icons, the heavy-handed faux 3D buttons, it’s all horrible to look at—it’s the near-total non-use of the right mouse button that really shows its age. This is truly software from another era.